It’s that time of year when I officially ponder some of the changes that need to occur in our home in order to make it run more effectively. In the area of our food purchases and meal planning, January ushers in the annual quick, swift in the bootie, and a Pantry Challenge is exactly what will help. My pantry and freezer suffer greatly from holiday purchasing and disorganization. They are packed with things stuffed in corners, lending itself to some recent food waste that always makes me so frustrated. Ever since my No Food Waste week, we’ve been very aware of using up what we have and not letting things go to waste, but this past week, I found quite a few things that needed to be thrown out, and I realize we have not used up what I have on hand. This Pantry Challenge is for everyone and I’m certainly not dictating any rules, since all of our needs vary greatly. Simply put, I invite you to join me this month in being the best steward of what you have on hand in your pantry, fridge and freezer. Attempting to avoid grocery shopping as much as possible, eat out of the pantry, freezer and fridge, while getting creative when my children complain, “Mom, there’s nothing to eat,” allows me to take stock of what I already have, save hundreds of dollars at the same time by not rushing unnecessarily to the store, and encouraging a heart of gratitude in our children with the bounty we do have. In the past, I have done pantry challenges where my goal was to only spend $100 for the entire month. Yes, now that was one of the most difficult challenges I have accomplished, but it was unbelievable at how creative I got with my cooking. I used up things that I assumed could not be used. My whole family needs to get back on a better eating schedule, so this is the perfect way to jump start those meal plans again. I will go into more details and specifics throughout the month. I do have a long term food storage stockpile, which I won’t touch. This challenge is specifically to use up those things that need to be used up, cleared out, and dug up from the bottom of my freezer. So who needs this as much as I do? Are you in? Just start where you are today and see what you can make from what you already have on hand. 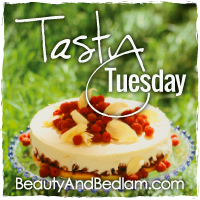 Welcome to the first Tasty Tuesday of 2012. I can’t even believe I get to share another year of cooking with you. I’m excited to see all the recipes that inspire me week after week. Thanks for hosting. I want to try to join in the pantry challenge, too. We’ll see how it goes! Thanks for hosting each week, Jen. I’ll be joining the Pantry Challenge, but instead of cleaning it out I’m hoping to stock it up. We moved this fall and depleted all of our stores before the move – we lived in campers for 6 weeks while in between homes. I have a deep freezer full of venison and hog to be made into sausage later this month, but not much else. Same goes with the pantry – not much to fall back on. However, I need to say within my budget so it will be a slow process of stocking up when items go on sale. One of my goals this year is to be very intentional in my cooking and purchasing and actually keeping track of my expenses and making a price book. Happy 2012 to you and your family! Thanks for the challenge! We have a lot of leftovers because of the holidays also! I have to be diligent about not letting them go to waste! Blessings to you and your family in 2012! Sounds like a great idea for the month of January – will be following along to get ideas. We have two freezers, and there are things that need to be used up. After all the grocery purchasing of the wonderful month of December, I need to focus on using up what is already there. Thanks for the encouragement with this idea. I’m so in for the Pantry Challenge! I tend to be somewhat of a food hoarder so I’m quite sure I can eat out of my pantry and freezer for the entire month with just a few grocery trips for fresh veggies and fruit. January is a great time of cleansing for the body, mind, spirit and now the pantry…thanks for posting the challenge! I also linked a recipe today for my Paleo version of Hoppin’ John! Thanks for hosting Jen. WHat a great challenge to host. My husband and I keep very little in our fridge or freezer, or cupboards for that matter. But I look forward to what everyones going to come up with! I’m sharing gf, df, sf Almond power bars. Have a great week. I’m so excited for this! I’ve been menu planning, and I definitely need to clean out the pantry. I’m excited to get rid of some stuff that we have but never eat. My goal is to eat more whole foods in the coming year, so I have to get rid of the crap in the pantry first! i’m in! today, i’ve got a chicken in the crockpot with some veggies (clearing out the veggie drawer, plus a few frozen bits) and some bean soup in another crockpot. lunch though was a bust, had some oriental type noodles in broth with a bit of chicken and it was yucky. rest are going in the donation bin – clearing out one way or the other, i guess. i also organized my pantry so we could find our ingredients, and planned one more meal – meatballs and spaghetti, for the next time we’re all home to eat a hot meal together. Just thought I would share an idea! I’ll definitely be trying to focus on a pantry challenge and getting more creative – it’s a little harder as hubs and I are following a special diet right now, but I can still improve on using things up! 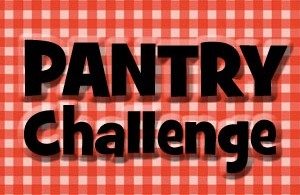 The Pantry Challenge is a great idea! This inspires me to not just say I want to take part … but really do something about it. Right now my freezer has a box on top of it to weigh the cover down. It is about time I solve the issue and not let this happen again.